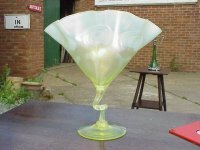 A hand blown Art and Crafts Vaseline glass vase with stylised floral detail and twisted stem by James Powell of Whitefriars London. Height 9", Width of top 9", Depth of top 3". 1890. Dr C Dresser, made by Benham and Froud. 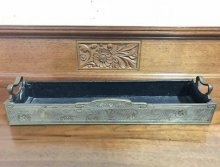 A Gothic Revival oak coal box with floral iron metal work. 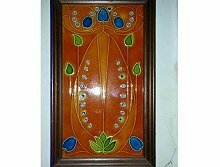 A large tube lined tile depicting stylised flowers in rich colours. Frame Height 13 1/4”, Width 7 1/4”, Depth 1 1/2” . Thomas Jeckyll. A rare Anglo-Japanese brass planter to compliment Jeckyll's timeless fire places that he designed for Barnard Bishop and Barnard. Height 3 1/2” Width 5” Length 18 1/2”. 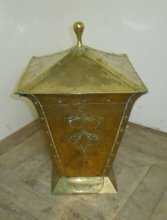 An Art and Craft brass coal bucket with stylized hand formed pomegranates retaining the original liner attributed to the Birmingham Guild handcraft. handcraft. H 17 1/2". x W 16". x D 16". 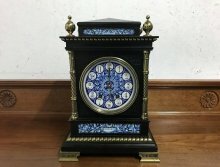 An Aesthetic Movement Ebonised clock attributed by Lewis.F.Day. with a French movement & possibly retailed by Howell & James of Regent St with ormolu brass mounts, a blue and white stylised ceramic dial with incised Anglo-Japanese devices surrounding each corner and blue floral and sunflower ceramic tiles above and below. 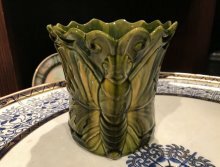 Height 17 1/2", Width 12 1/2", Depth 10"
Dr. Christopher Dresser (1834-1904) for Ault, a butterfly moulded cache pot, green-yellow glazed, impressed and moulded mark, no. 312. 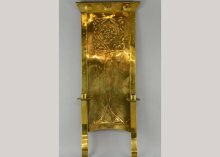 Bruce Talbert (1838-1881), a Reformed Gothic Brass triform mantel timepiece. The movement stamped 'UAP Brevete SGDG', engraved with mottoes and 'W&GCT Broadlands July 26 1875'. Hugh Birkett. A 12 sided clock specimen wood. Dimensions: H 12.3", W 12.3". "IMPROVE TIME IN TIME WHILE TIME LASTS, FOR SOMETIMES NO TIMES WHEN TIMES PAST. 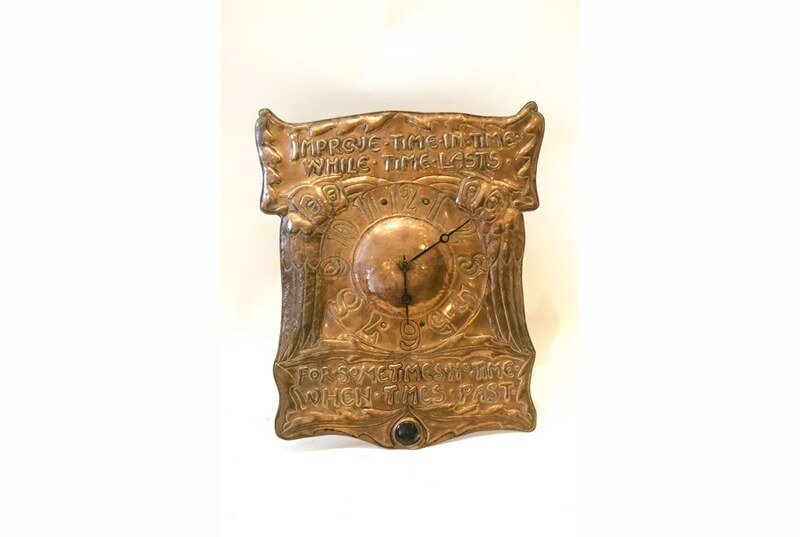 Height 18", Width 15", Pendulum length from the bottom of the clock 16". Margaret Gilmour. 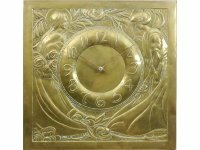 A large and impressive hand formed Glasgow School brass clock decorated with stylised Glasgow ladies in long flowing dresses, entwined with Glasgow roses. The pendulum with stylised Glasgow roses and stylised details to the weights. With single chiming movement. Signed M.G.to the right hand corner. Height 17", width 17", depth 7", pendulum length 7". H 7". x W 4". x D 4". A large exhibition quality hammered copper vase decorated with with cast brass Art Nouveau maidens and brass handles. 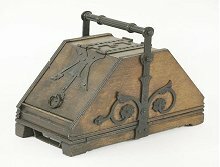 Designed by Albert Mayer, for W M F Wurttembergische Metallwaren Fabrik. A large exhibition quality hammered copper vase decorated with with cast brass Art Nouveau maidens and brass handles. W 8", D 8", H 24". Liberty and Co. A rare full roll of original fabric. Height 157 1/2", Width 30 1/2". Nicole Freres. Mystique de Geneve. 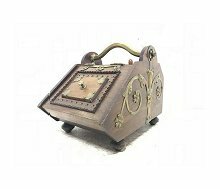 A rare and wonderful music box which when wound will play 6 different tunes. Set into an inlaid rosewood box. The key has had a larger handle braised to it many years ago to make winding it a little easier. Lovely original condition. H 4". x W 16". x D 5". Thomas Jeckyll, attributed, probably made by Barnard Bishop and Barnard. A pair of Anglo-Japanese brass fire dogs with stylized birds to the circular tops. Dimensions: H 19.5", W 7", D 7.5". 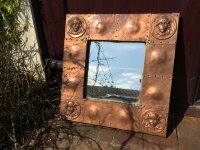 A rare hand made Birmingham Guild of Handicraft copper centre piece, with stylised repouse floral details to the surface, on triform base with curled under feet. Stamped BGH. H 4". x W 11". x D 11". Tray measurements H 3". x W 22". x D 12". H 22". x W 30". x D 5". Liberty and Co. attributed. 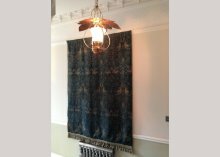 A large subtly hammered pewter oblong mirror with cantered corners and unusual square turquoise Ruskin jewels. 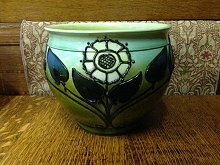 Poole Pottery. 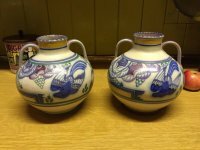 A pair of vases with prancing deer and colourful floral detail. Height 13 1/2", Width 1 1/2", Depth 2 1/2"
A W S Simpson of Kendal. 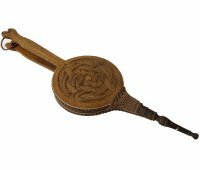 A good pair of Arts and Crafts oak bellows with Celtic interlacing carving. Height 34 1/2", Width 10 1/2". 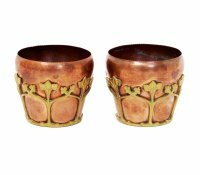 A petite pair of stylish copper and gilt plant pots in the style of WAS Benson. Height 3", Width 3 1/2". 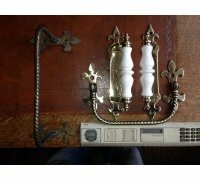 A pair of Gothic brass rope twist towel holders and a pair of decorative Victorian brass and ceramic door handles. 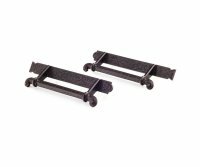 Towel holders : Width one 9" and the other 10". Handles : Height 8 1/4", Width 1 1/2", Depth 2 1/4". W.A.S Benson. 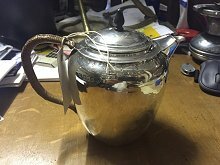 A rare silver tea pot with wickerwork handle. Assay marks for London 1903. C.R Ashbee. The Guild of Handicraft. 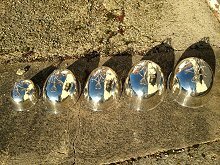 A set of four silver plated tureens, with a classic wire work handles. Each with a small hanging hook. 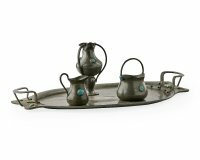 I have more GOH tureens further down the page see NA 29. Height 10", width 16", depth 12"
Height 8.25, width 14", depth 10"
Height 7", width 12", depth 8.75". Height 6", width 10", deth 7.5". Large X 2. Height 8 1/4", Width at base 10 3/4" Length at base 13 3/4". Medium X 2. Height 7", Width at base 9 3/4", Length at base 11 1/2". Small X 1. Height 5", Width at base 7 3/4", Length at base 10 1/2". Bromsgrove Guild. 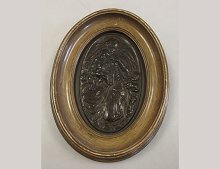 A bronze oval wall plaque. Sir Frank Brangwyn RA. 1867-1956. Colour wood-cut, signed by the artist and engraver. 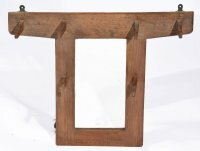 An interesting collaboration between the artist, Brangwyn, and the Japanese painter and etcher, Urushibara, who made the wood-block. Sir Frank Brangwyn is one of the most individual and talented artists of the early 20th century. He was a painter, mural artist, furniture maker and etcher, a product of the 'Arts and Crafts'. He studied under William Morris, became RE in 1907, and RA in 1919. Exhib: Fine Art Society 478, Glasgow Institute of Fine Arts 42, Walker AG 38, Royal Academy 46, RBA 34, RE 8, RHA 4, ROI 8. Royal Scottish Academy 27. Frame Height 24 1/2", width 30". Dr. Christopher Dresser. Benham and Froud. Left: A brass coal bucket, With hand wrought whiplash iron handle and stylised floral repousse work. £POA. 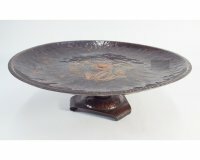 Height 14", width 21", depth 14", circular base 9" across. Right: A copper coal bucket, with and wrought whiplash iron handle. Height 14", width 21", depth 14", ciruclar base 9" across. Dr. Christopher Dresser attributed. 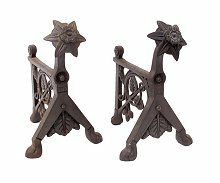 A pair of cast iron fire dogs, with registration design diamond 1876. Height 11.25", width 7", depth 9". Wardle. 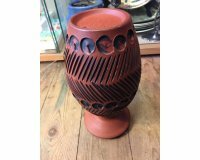 An Arts and Crafts planter with pipe line decoration of stylised flowers and leaves, in strong colours. 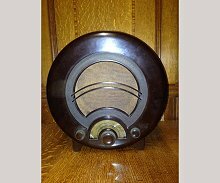 An Ekco AD36 All Electric Bakerlight Radio. Designed by E.K Cole. Southend-on-sea, Essex. Case has crack at back of one foot, inside looks really good, but it hasn't been tested. Height 14.5", width 14", depth 6.5". 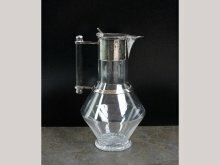 A classic James Dixon and Sons EPNS decanter by Dr. C Dresser. Height 10", width 5 1/2". Circa 1870's. Royal Daulton. 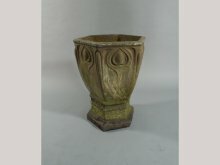 A Lambeth terracotta garden pot designed by F.C.Pope. Height 19 1/2", Width 13 3/4". 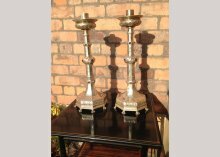 An impressive pair of tall Arts and Crafts silver plated candle sticks with semi precious stones, stylised floral detailing and lions paw feet. Approx Height 16", width at base 7". 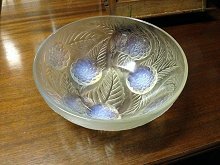 Lalique Dahlias fruit bowl with vivid Vaseline details to the Dahlia heads. 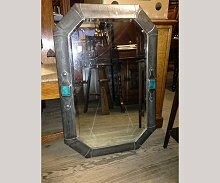 Height 4", Width 9 1/2". Circa 1920's. 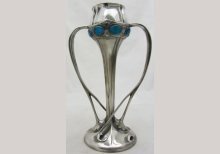 A Liberty and Co Tudric Pewter and Enamel organic vase with blue/green enamel roundels to the top and twin whiplash handles. Stamped 029 / 3. Damage to one enamel. A beautiful Arts and Crafts Peacock enamel mounted in hand beaten silver frame attributed to C R Ashbee and The Guild Of Handicraft. 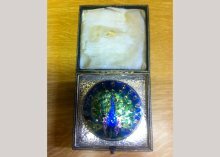 In it's original case, the colours are the most vibrant I have ever come across and the enamel is in mint condition, although there are no silver marks to this piece it has tested silver. I do need to do a little more research on this piece. Dryad. Attributed to William A Pick. 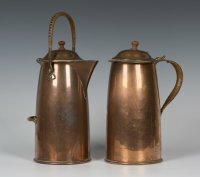 A pair of good quality copper water flagons. Maker stamped to the bases and model numbers 296 and 385. Height 11", Width 4", depth 4". 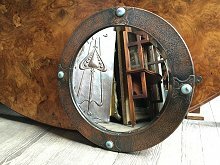 A Liberty style Arts and Crafts circular copper mirror inset with four turquoise and red Ruskin jewels. A little Arts and Crafts silver mustard pot with peacock decoration and original Bristol blue liner made by William Hasler. A Scottish School brass double candle sconce by Margaret Gilmour with stylised Glasgow rose. Circa 1900. Height 30 1/4", Width 12 1/2. A pair of Moorcroft silver hip flasks, with enamel river scenes. 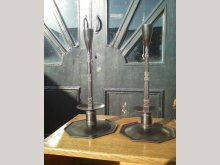 A rare and important pair of hand formed steel candlesticks designed by Ernest Gimson and made by Alfred Bucknell. 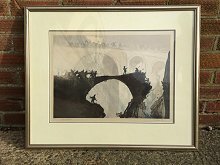 The last three images are his original signed drawings which are held at The Cheltenham Museum Collections.